Jimmie Johnson won the rain-shortened NASCAR Clash race at Daytona after triggering a crash that took out most of the field. On lap 55 of the non-championship pre-season race Johnson attempted to make a move on Paul Menard, who had dominated until that point, but ended up sending the Wood Brothers Ford driver into the wall and back into the pack. 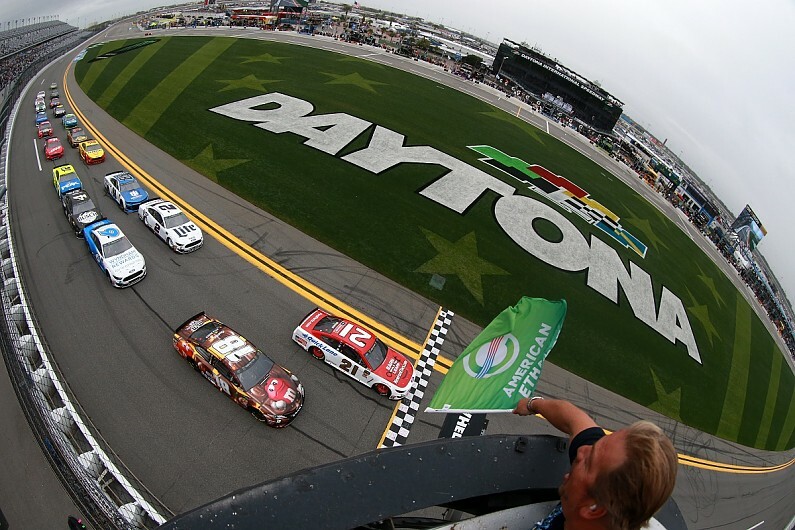 Only eight cars in the 20-car field – made up of 2018 polesitters and previous Daytona winners – escaped the incident still running and on the lead lap, and the arrival of heavy rain moments afterwards meant racing ended there. Menard had drawn the pole position in a pre-race lottery – his third in five Clash starts – and led all but four laps of the race until the crash. He spent the majority of the event on the faster high line and was rarely presented with a legitimate challenge for the lead before Johnson’s move due to the largely single-file nature of the race. The final stoppage for rain was one of three red flags caused by the weather. The first came on lap eight, and another following on lap 39. Menard was the leader at the time of both stoppages. Ironically, following the second restart following a red flag Menard was given a push from Johnson’s Hendrick Chevrolet that allowed him to stay out in front of the fast, high line and eke out a lead. With the threat of heavy rain and an early finish growing closer, Penske trio Joey Logano, Ryan Blaney and Brad Keselowski moved to the inside to mount a challenge to the front with 23 scheduled laps to go. Four laps later came the race-ending pile-up, with Johnson, Kurt Busch – who had a largely anonymous race – Logano, and Blaney all staying ahead of the chaos and claiming the top four positions. Alex Bowman, who was one of just two drivers to pit following the previous red flag, was fifth at the time of the stoppage, taking advantage of the track position afforded to him by the late stop to avoid the crash. The other driver to pit late on was Bowman’s Hendrick team-mate Chase Elliott, who finished behind Austin Dillion in seventh. Aric Almirola was the final driver on the lead lap at the time the caution flag flew in eighth place. Ryan Newman was also classified as being on the lead lap, in ninth place, despite stopping to repair damage. Among the 11 other drivers involved in the incident were Daniel Suarez, Kevin Harvick, Kyle Busch, and 2017 Cup series champion Martin Truex Jr.
Menard was eventually classified in 13th place, despite leading more laps than he had in all of his four other Clash appearances combined.